An unlock quest is one that, upon completion, opens up new features to the player. This can be anything from a new area, to new abilities, to even aesthetic things such as different looks for the buildings in the area. Typically the harder quests of these allow the player to then progress through the storyline, or open up an even harder dungeon for them to explore and get better loot from. Unlock quests can be a kind of contextualizing quest that introduces the player to an ability or game feature before giving it to them. Games that focus on unlock quests typically start the player off with very few conveniences, making achieving their objectives difficult. By completing these quests and unlocking new game features, they're rewarded with something more than experience or loot, but also new aspects of the game, which is in many ways much more rewarding. This allows the game world to continue to evolve as the player plays through it, keeping game play fresh and exciting. Fallout 3. 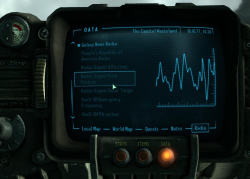 At the start of the game the GNR signal is extremely weak, emitting only static when the player is outside of the Washington D.C. area. Upon fixing their dish, the player can hear the music and news of GNR from anywhere in the wastes. Final Fantasy Tactics. There is a massive side-quest chain in this game that progressively unlocks different characters who each have unique fighting styles, especially in comparison to the basic characters collected throughout the main game. This opens up new strategies and choices when putting together a party. Evolving Environment - This is a method of triggering an environment change that makes the player feel like they're changing the world.